Maiden Nation is a nation designed for change. By empowering women through ethical fashion, their marketplace where items are designed with both beauty and social consciousness in mind. But it’s more than that, Maiden Nation is social network of women living a global movement. I’m a Maiden Nation Citizen and have been since the day it launched. Maiden Nation founder, Willa Shalit, wants all Maiden Citizens to connect over their ideas and goals. By creating a marketplace where items are designed with both beauty and social consciousness in mind, Willa has done just that. When I was asked to review Chan Luu’s Glamour Kiss Kiss Bracelet, and to help share the Maiden Nation Community, I couldn’t say no. Named for the signature Haitian greeting of a peck on each cheek, the “Kiss Kiss Bracelets” are designed by Chan Luu especially for Maiden Nation by members of the Hands Together Cooperative in Haiti, in partnership with the Glamour Women of the Year Fund Initiative and the United Nations Ethical Fashion Initiative. 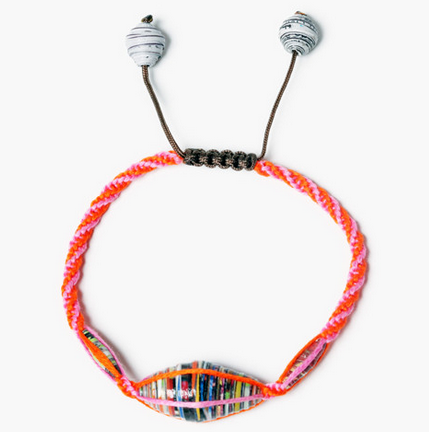 Wrapped to go, Chan Luu’s bohemian creation tucks intricately layered paper beads inside a neon-hued net of threads. I have a large wrist and was worried it wouldn’t fit, however each thread on the ends is movable and I’m able to pull the beads in to expand the bracelet size, and once it’s on, am able to readjust it to fit my wrist beautifully. It’s appears to be very delicate, but the actual weave of the bracelet is intricate and layered, creating strength and durability. The braiding is exquisite and done by master craftswomen. If this intricate work was being done in Paris for the major fashion houses, we would call these creations haute couture. And that’s what the goods from Maiden Nation, and my “Kiss Kiss Bracelet”, are. Haute couture for my wrist. Each purchase of the “Kiss Kiss Bracelet” will help the survivors of the 2010 earthquake build a new life by supporting this new business. Additionally, for every bracelet sold, $6 will be donated to Sean Penn’s J/P Haitian Relief Organization to support community development in Haiti. Additionally, to support victims in the U.S. and Haiti coping with the aftermath of Hurricane Sandy, Maiden Nation will also donate $2 to the American Red Cross. Helping artisans to get out of poverty with dignity is important to veteran jewelry and accessories designer Chan Luu, and her unique approach has been instrumental to her success. With a production process that spans several countries – including India, Thailand, the United States and her native country of Vietnam – Luu’s approach takes the crafts of her artisans, inspired by their ancient traditions, and modernizes them. This approach, according to Luu, ensures the “well-being of the people and communities” behind the products. You can buy the the Glamour Kiss Kiss Bracelet at Maiden Nation for $25. 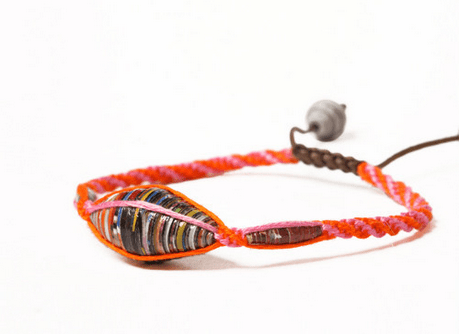 Red cotton cord, nylon cord, and paper beads. Adjustable length. Keep dry, do not get wet. No compensation is being received for this post. Maiden Nation provided a bracelet for me to review, but all opinions contained here are my own. While I’ve just gotten back from my trip to Detroit (thanks Ford), I along with many others have had our hearts and minds on the people of Haiti. Today marks the anniversary of the terrible earthquake that hit the country, and while a year has passed, very little has changed for Haiti and its people. To think that an earthquake could take anywhere from an estimated 230,000 to 300,000 lives and leave up to a million people homeless still boggles the mind. But, there are people looking to change the situation there for the better. Willa Shalit, CEO of Fairwinds Trading, has started the Heart of Haiti project and Macy’s is proudly offering products made by Haitian artists and as a result, directly affects the lives of the people in Haiti with its Heart of Haiti product line. The line-up includes home furnishings like vases, wood carvings and paintings as well as jewlery and quilts. 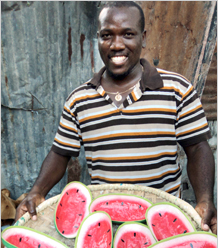 All of the Heart of Haiti products are available online and in select U.S. stores. For more information on the Heart of Haiti and to see the whole Heart of Haiti product line, head over to Macy’s website for more information. Today, while you’re in the lovin’ mood, why not share your big geek heart with others. Geek Girls Network™ & Geeky Clean have created a fundraiser to support the Haiti Relief called Geeks With Heart. Through Mercy Corp, Geeks With Heart has a fundraising goal of $2500 and there’s no minimum for donations. If you can spare just one special cup of coffee, an iTunes download, or a crispy chicken sandwich, donate to Haiti instead. Show Haiti why geeks have heart! As extra incentive, and not that you need any, once Geeks With Heart reaches $2500, all who donated will have the chance to win a prize from an amazing grab bag of geek prizes! So donate, tweet it up, put a badge on your website, and tell all your friends and family. Thanks! Geeks With Heart Haiti Relief Fund from Galaxy Sailor on Vimeo. Today’s post was supposed to be about “healthy you”, winter skin, hair, type thing. However, I am pulling that off of the table. Today, I am asking you to help. Unless you have been living under a rock, you know that Haiti was hit with an earthquake of immense magnitude. Thousands have died. Even more are homeless. This is not just affecting the citizens of Haiti. There are more than 46,000 Americans in Haiti, many working as missionaries. The U.N. has 100 staff members unaccounted for. Donate if you can. Give blood. Pray. The first 48 hours after a natural disaster such as this is focused on search and rescue. It is critical so that rescue efforts don’t turn into recovery efforts. Go to Amazon.com and donate to Mercy Corps. Their greatest priority is providing food, shelter and water to the survivors of the devastating natural disaster. Oxfam’s Latin American emergency response team is based in Haiti. They have had people on the ground from the start. Avoid scams. Only donate to reputable organizations. People are going to try and take advantage of this opportunity to stand by your fellow man. Sad, but true. One such scam is the one being reported on social media networks such as Twitter about UPS. The rumor is that UPS will give free shipping up to 50lbs to Haiti. UPS has donated $1 million dollars towards the recovery effort. This includes $500 thousand of in-kind services for the shipment of needed supplies. For the organizations that have donated, if you see someone from there. Tell them thank you. Whether it’s the NY Yankees, Disney, the Livestrong Foundation, whomever. Just say it. Do what you can. Do it now. One day, it could be you and your family receiving aid from these organizations.